Whether you’re a book lover or a sucker for a fairytale, a beauty and the beast wedding theme can be absolutely beautiful. There are a lot of great ideas that you can use without spending a fortune. 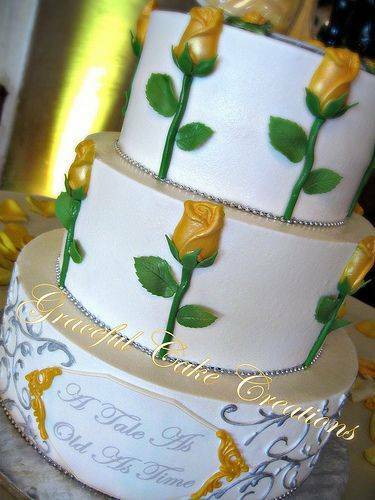 Here are a few great ideas for a beauty and the beast wedding theme. This is a fantastic centerpiece idea for this wedding theme; all you need are red or pink roses and glass domes that are available from your local craft store. Display the rose in a pretty vase and then cover it with the dome. 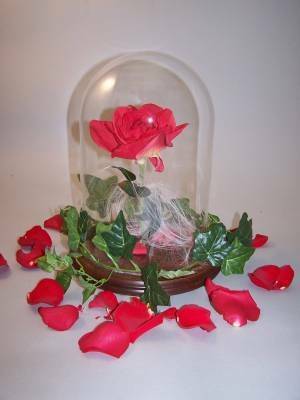 Not only are these perfect for a beauty and the beast theme, but they’re inexpensive centerpieces as well. The options when it comes to beauty and the beast cakes are limitless. Check out these great and very different options that all fit this wonderful theme. 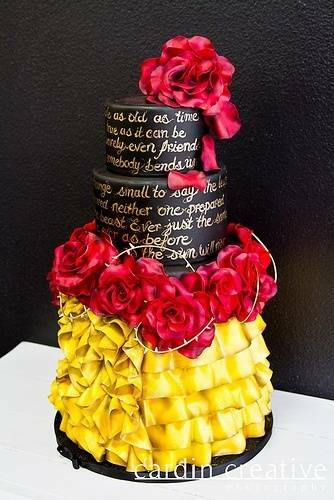 This beautifully vivid cake features those trademark yellow ruffles, plenty of roses and on the black tier, the words to the beauty and the beast theme song. This is an old-fashioned cake featuring the beauty and the beast topper. 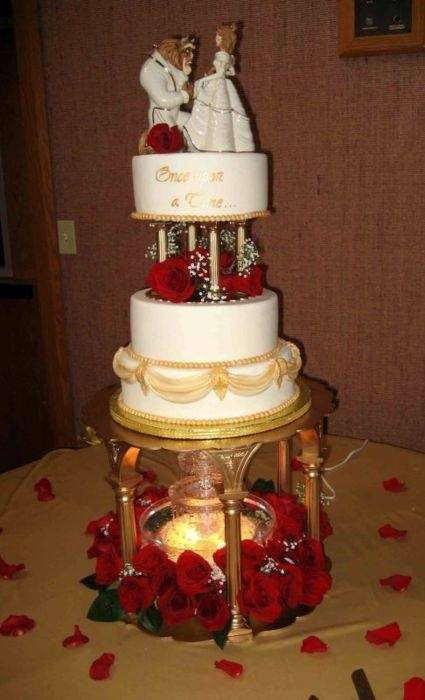 The cake is elegant and pretty, with roses embellishing the space between tiers and the bottom. This woman has Belle’s hairstyle down perfectly! 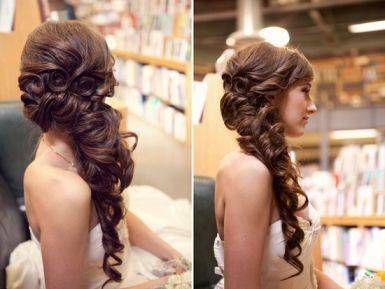 The hair is pinned around the back and to the side, where it falls down her shoulder in loose ringlets. This gorgeous décor is the perfect beauty and the beast décor. 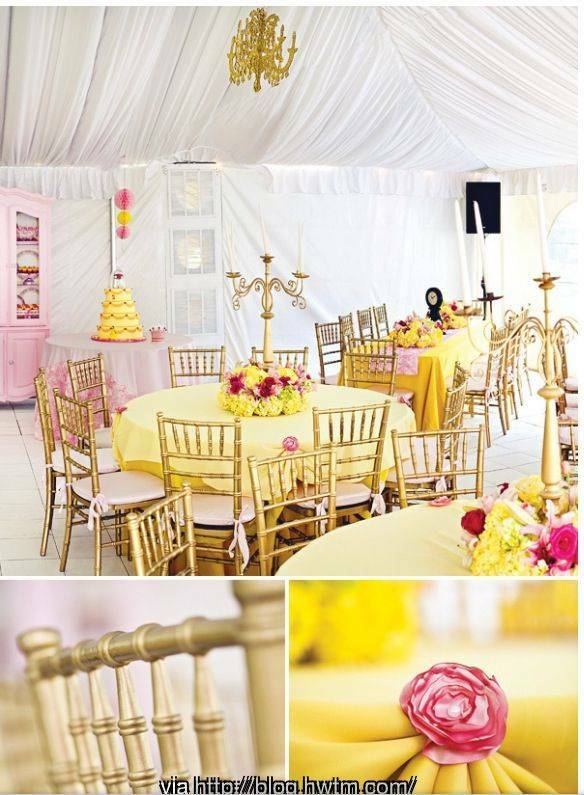 It’s achieved by using butter-yellow table linens and plenty of pink and red rose embellishments. These are just a few of the choices you have for a gorgeous beauty and the beast themed wedding. Watch the movie again and make notes, or look through other pictures for inspiration. When done correctly, this can be a stunning theme.